Yamashita Tomohisa will be starring in a film on October 11, 2014. The story will be a live adaptation of a popular shoujo manga by Mikimoto Rin, Kinkyori Renai (Close Range Love) which sold a total of 180 million copies. It will be about the love story of a prodigy schoolgirl with a cool reserve and a tsundere, handsome teacher. Yamapi will be playing the role of a teacher for the first time. He'll be playing the role of Haruka Sakurai who is a ladies man and is very popular with the girl students for his beautiful appearance. He is very confident and has a high pride and has never been in love with people's glance. The role of Uni Kururugi will be played by Nana Komatsu. Uni often wears a neko hair clip. 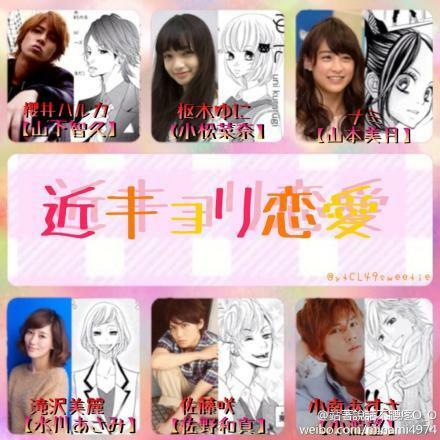 The cast will also include Mizukawa Asami, Yamamoto Mizuki, Hirofumi Arai, and Kotaki Nozomu (Johnny's WEST). Kotaki's role will be Matoba, a yankee classmate of Uni. give me link for download pleaseeeeeeeee!!!! ini beda sama yg versi drama? ?